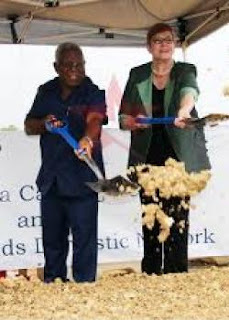 Australian Foreign Minister Marise Payne has joined Solomon Islands caretaker Prime Minister Rick Hou in a ground-breaking ceremony to mark the commencement of the next phase of Coral Sea Cable System construction in Honiara, Tuesday. The ground-breaking ceremony took place at Coral Sea Cable System construction site at Lengakiki in Honiara. Hou in his speech said his government on behalf of the people of Solomon Islands thanked the Australian government for helping Solomon Islands realise its dream to be connected to a submarine cable network. Australian Foreign Affairs Minister Payne affirmed that Australia will invest up to AUD$200 million (US$144 million) in the Coral Sea Cable System and Solomon Islands Domestic Network. It is understood that since the signing of a AUD$137 million (US$99 million) contract with Vocus in June 2018, construction of the Coral Sea Cable System and Solomon Islands Domestic Network has progressed well. The landing station at Lengakiki will soon host a 4, 700-kilometre-long fibre optic submarine cable linking up Sydney, Port Moresby and Honiara. Hou confidently stated that this will be a big boost for the country’s economic growth and country’s development journey into the future. “It will redefine Solomon Islands development and nation building process,” Hou said during the ceremony.